The one main thing I love about New York (and the one main reason why I can't bear to move away) is that there is ALWAYS something fun and exciting to do in the city. Whether it be a popup event or a celebrity talk or a film festival, there seems to always be something going on. A lot of my readers have been asking me where I find out about all the different events and stay up to date on NYC happenings. A friend of mine recommended Pulsd to me and I think its the gold mine! They list every event you could possible dream of plus the occasional deal (similar to Groupon in that respect). My Pulsd referral link is below if you want a free $5! Anyways, Pulsd is how I found out about Brit+Co's awesome popup event, Create Good! There were many different events held throughout a period of 4 days (some free and some ticketed). I chose to attend a talk regarding Create Good Business where several female entrepreneurs came to share their wisdom. A cute little 12 year old spoke about her outstanding lemonade business, Me & The Bees. Mikaila Ulmer was super inspiring as she has built such a giant successful brand (her lemonade is being distributed in Whole Foods) at her young age. She mentioned that her motto in life was to not worry about how things could fail, but to not be discourage and keep going. Randi Zuckerberg, Facebook Mark Zuckerberg's sister, was also present and was equally inspiring as she spoke about how being rejected from Broadway (although she later did achieve this dream as well) led her to working in the male dominated technology field and launching Facebook Live. To me, she was the definition of #girlboss as she has gone from having a successful career at Facebook to writing bestselling books to even perfoming on the Rock of Ages Broadway show. For any throwback Buffy the Vampire Slayer fans out there, Sarah Michelle Gellar was also in the house! 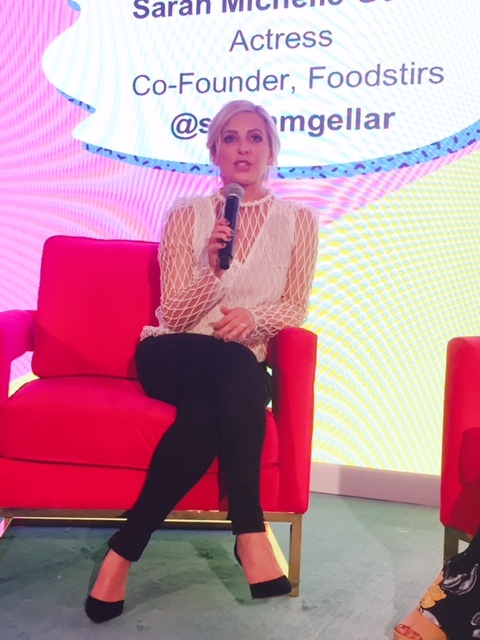 I thought I was going to fall off my seat when she came out on the stage to speak about her food brand, Foodstirs. Foodstirs offers organic baking mixes with healthy ingredients and after sampling the brownies- I can tell you they are super yummy. Although she was a famous actress, Sarah didn't get an easy foot in the business world door. She dealt with reject time and time again until Target agreed to finally carry her line after she physically demonstrated one of her pancake mixes for their executives. I loved how passionate Sarah was about her product and how she insisted that no is the first road to yes. Last but not least, two female founders of startups spoke about how their companies began and how they've grown from tiny brands to well known companies. Radha Agrawal of Daybreaker and Stephanie Korey of the suitcase company, Away, gave such meaningful and useful advice on how to take an idea from nothing to a business. Radha mentioned that her ideas came to her once she began to evaluate what sucked for her in her own world and then whether or not it sucked for other people. As a result of being groped and harrassed a nightclubs, she came up with the idea for Daybreaker- a morning club where instead of alcohol, green juice and breakfast is served and yoga takes place. Although I've never considered myself an entrepreneur with the latest or greatest ideas, I thought all these women really motivated me on continuing to work and improve this blog. Sometimes I feel as if I'm wasting my time writing and no one really cares about what I have to say. This Create Good event has shown me that even if no one cares or reads right now, as long as I remain passionate and keep striving for my goals, I can eventually succeed as well.